Hi everyone! Checking in to confirm that I am alive! Before I updated, I wanted to fix the error messages that Cutenews was displaying that made this site look even deader than it is (is that possible tho?) Haha, but every time I fixed one thing, another thing broke. Finally after like twenty minutes I stopped getting error messages, so hopefully all is well. I haven't done anything for Moonflame, but I have made two designs for two different groups here at my school. If you're interested in taking a look at what I've been up to, you can check out the new design for The Underground Shakespeare Company and for The KCECH Garden Club. These were some non-profit designs created for groups that I am a part of, but I decided to go ahead and stick a copyright on there for our 'professional' website design business (lol). Both sites are not totally complete, as you may find out, but I'm working on it. Gotta get through this semester first, tho. Speaking of, I'm going to get back to studying for finals now. I've been peeking at everyone's sites now and again; I apologize if I don't say hello! But, keep up the good work friends! Your sites get more and more beautiful with each new update. Hey guys! I'm here with some announcements and some excuses too. First the announcements include three new additions to the family (as in new affies)! Please welcome Sasha of Vizune, Thuy of Haria Graphics, and Cali of Sonatina Designs! Go check out these lovely websites immediately if not sooner! I'm so thankful to have them as new friends! Also, Moonflame now has a domain thanks to my older brother. You can change your links if you're interested (the new URL is http://www.moonflamedesigns.com), but http://www.mfd.aki-mono.com will still get you to the site (as I'm sure you noticed, hehe). I've had this site for what will almost be a decade; it's about time it started sounding more official! Excuses include but are not limited to a heart crushing break up after a five year relationship (I won't bore you with the details), an amassing amount of school work in the wake of my spiraling sadness lol, and I'm doing a play so there's a lot of rehearsals. Currently working on the Reflection design with some help from Sasha, so that should appear sometime some and I'll probably do either an edit or maybe a new update. Anyway, enough complaining. 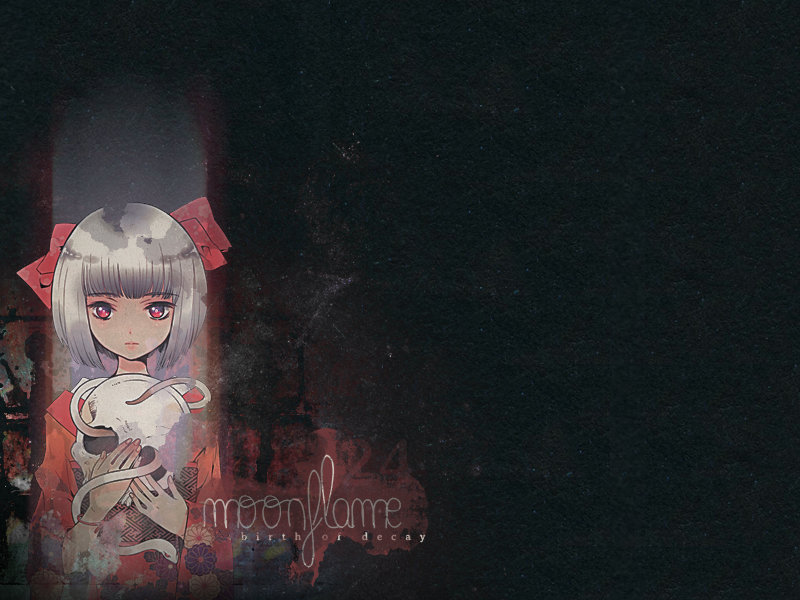 In my procrastination binge I made a new design for Moonflame. I still have yet to put the last design, Reflection, into web layout form. Honestly having trouble figuring out how to make it work for a web layouyt. So stay tuned for that one if you're interested. 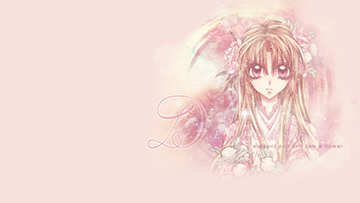 Here's the preview for the new design, Delicate, featuring artwork by Arina Tanemura. In other news, I got a random spam submission to my affiliation form although I couldn't get my own submissions to go through last month. Anyway, I sent another submission and it worked. So if you're interested in affiliating with me, the form is here. If I don't get back to you within a week, assume the form broke again and just send me a plain old e-mail. I don't bite. Anyway, stay cool! I said that mostly because I wanted to use the cupcake with the sunglasses emoticon.